Here is an overview of the 2019 held and known meteor shower. The most fertile showers are marked red in January, the Quadrantids (in 2019 a very high ZHR), in August the Perseids with a normal ZHR and in December the Geminids with a ZHR extremely well. The smaller but still meteorscatter well usable shower are marked in yellow. The green marked shower are the Draconids that are especially worth watching. 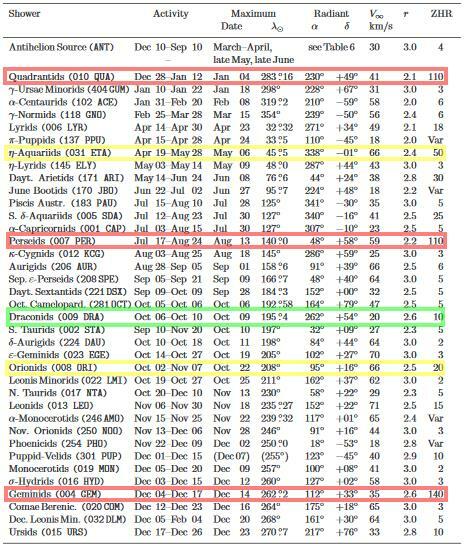 Since its intensity is badly predictable, it is particularly good to observe this meteor shower by year. In 2018 he brought a ZHR of 150 which was the most intense meteorite show in 2018. He was previously classified on a ZHR of only 10.